This paper systematically reviews evidence on the health outcomes for women in Australia experiencing intimate partner violence (IPV), noting that causal pathways are complex and subject to a rapidly growing body of knowledge. 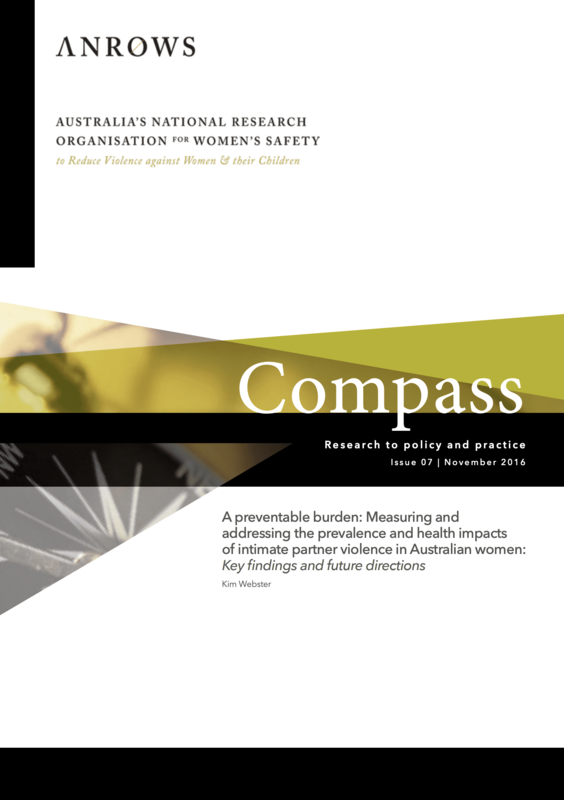 It also describes current data sources on the prevalence of IPV and possible ways to address the gap in exposure data for Aboriginal and Torres Strait Islander women. 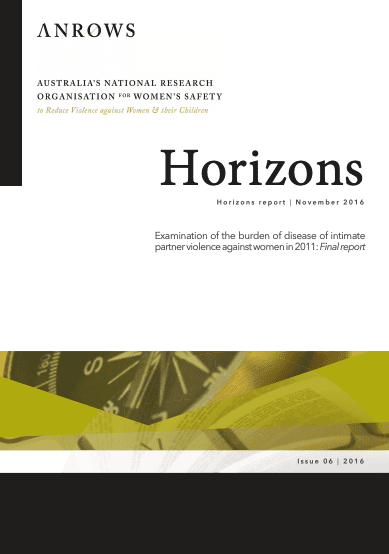 The paper will inform the inputs required to produce estimates of IPV’s burden of disease estimates in Australia. These findings will be released as a Horizons report. Based on forty-three studies found to have sufficient evidence to be potential inputs for the disease burden calculations, there is strong evidence that women in Australia who experience IPV have an increased risk of depression, pregnancy termination and homicide. There was also a possible increased risk for anxiety, premature birth and low birth weight, cardiovascular conditions and self-harm. The evidence found the impact of exposure to IPV on alcohol and drug use disorders was bi-directional, and risk should be carefully interpreted. The paper identified a number of research gaps that could inform future research on the health outcomes of women who experience IPV. Where there is insufficient evidence to demonstrate causality (between IPV and health outcomes), there may be potential for further analysis of existing datasets to derive measures of association, and to use direct evidence based on existing datasets for health outcomes such as non-fatal injuries. The health outcomes from emotional abuse are an emerging area for further exploration, due to the availability of exposure data (independent of physical and sexual violence) collected in the Australian Bureau of Statistics’ 2012 Personal Safety Survey. This commissioned work is part of the ANROWS Landscapes series. ANROWS Landscapes (State of knowledge papers) are medium length papers that scope current knowledge on an issue related to violence against women and their children. Papers will draw on empirical research, including research produced under ANROWS’s research program, and/or practice knowledge. On, M. L., Ayre, J., Webster, K., & Moon, L. (2016). 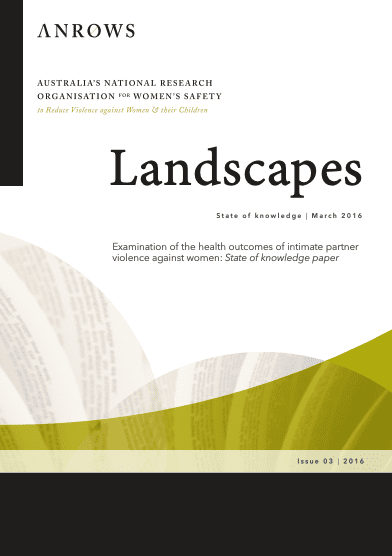 Examination of the health outcomes of intimate partner violence against women: State of knowledge paper (ANROWS Landscapes, 03/2016). Sydney, NSW: ANROWS.